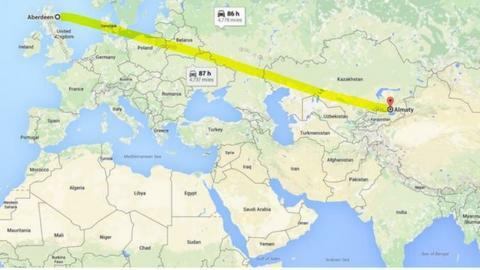 You've only got two options if you're flying from Aberdeen to Almaty on Thursday: via London or Beijing. Via London, it's 10 hours and it is July, so surely you can get the time off. Why do it? The chance to witness football history as Aberdeen take on Kazakhstan's Kairat Almaty in the Europa League third qualifying round first leg. At 3,415 miles as the crow flies, it will be the longest distance travelled in a European club competition. What if you can't afford the £3,000 for flights or would prefer to drive? To make the 15:45 BST kick-off, you'll have needed to set off 87 hours beforehand - and that's only if you're not planning on sleeping. Or maybe you don't fancy travelling so far? You could just as easily take a break in Sudan or nip to Toronto for the evening. You would be losing out on the air miles, though. Still not convinced? Then consider this: by joining the 65 Aberdeen fans going to the game, you might well find yourself bitten by the extreme football adventure bug. And if you find yourself wanting more, then keep your diary free for this year's French Cup first round in November. Although fixtures have not yet been released, last term Trelissac, of Lucon in western France, made a round-trip of over 21,000 miles to the French overseas territory of New Caledonia in the South Pacific. All for a 3-0 defeat. Whatever you decide, spare a thought for the Aberdeen players. After the 6,830 mile-long round trip - the equivalent of travelling between London and Glasgow nearly 20 times - they face an away game with Dundee United on Sunday as the Scottish Premiership gets under way. You can share your stories of epic away days in our today's BBC Sportsday live page. Get involved using #epicawaydays on Twitter or post a comment on the Match of the Day Facebook page.